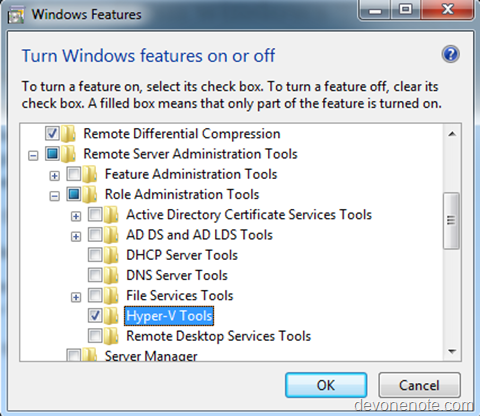 Once Hyper-V role is enabled on windows server 2008/R2, Hyper-V manager will be installed automatically. However, you don’t need to log on to Hyper-V host server to use Hyper-V manager. Instead, you can manage Hyper-V machines remotely from you Win7 desktop. Now you can manage Hyper-V virtual machines from your windows 7 box. Apr 24, 2010 – RSAT does not work on VISTA. For VISTA, you should install MMC Management Snapin instead. It’s really hard to figure out the right version to install. Thanks, just have hpyer-v manager enabled on my laptop win7 sp1 successfully. The only requirement to install it is that you have to run Vista SP1 which I do. After installing it on my Vista Ultimate machine is worked perfectly however when I’ve tried to install it on Vista Home Premium machine it doesn’t create any files. I’ve tried to manually move files from ultimate machine to home premium but that didnt help since all virtualization assemblies are missing on home premium. Can someone please verify that Hyper-V Management tools is not compatible of Vista Home premium Sp1 or direct me into right direction on order to get it working. i tried to install 64bit one on my windows 7 sp1 home premium 64 bit and it said that this update is not applicable to this computer.